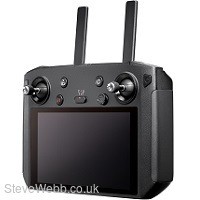 Ultra-Bright Display - The DJI Smart Controller has a built-in 5.5-inch 1080p screen, providing an ultra-bright display to keep your live feed easily viewable, even in direct sunlight. At 1000 cd/m2, the display is approximately twice as bright as conventional smart device screens. OcuSync 2.0 Full-HD Video Transmission - Equipped with OcuSync 2.0 Full-HD video transmission technology, the DJI Smart Controller supports automatic switching between 2.4 GHz and 5.8 GHz, reducing the influence of environmental interference on drone operation and image quality. This also ensures reliable long-range transmission at distances of up to 8 km. Efficient and Portable - The DJI Smart Controller connects to your drone as soon as it's powered on so you can take off fast and never miss a moment of the action. Featuring an integrated design with detachable control sticks, the DJI Smart Controller is also portable enough to bring with you anywhere. Reliable in More Environments - The DJI Smart Controller is capable of stable operation in temperatures ranging from -20°C to 40°C, giving you a reliable HD connection with your drone in more places. DJI Go Share - Easily transfer your aerial photos and videos from the DJI Smart Controller to your mobile device using the DJI GO 4 app’s new Go Share function. 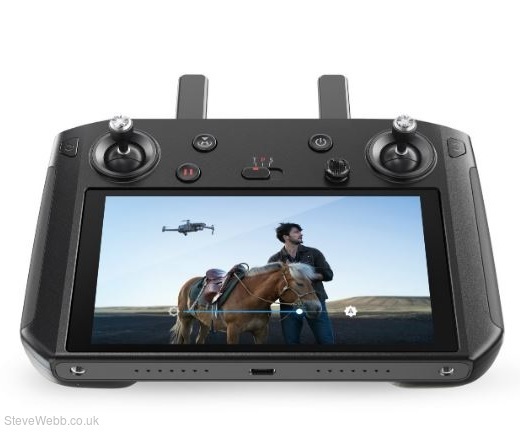 Customized System - The DJI Smart Controller's customized Android system and optimized DJI GO 4 app give you freedom from the restraints of conventional mobile devices to ensure faster, focused aerial creation. The Smart Controller also supports third-party apps for a variety of additional sharing and editing options. Excellent Audio and Video Performance - The DJI Smart Controller comes with a built-in microphone and speaker for expanded options such as livestreaming. It can also playback video through the HDMI port at 4K 60fps with H.264 and H.265. SkyTalk - The new SkyTalk feature is an amazing way to let others in on your aerial experience. Use it to livestream your drone’s camera view directly to social media platforms like Facebook and Instagram. It also allows you to create and share short videos instantly. Long-Lasting Battery Life - The 5000mAh battery supports Quick Charging and can work continuously for up to 2.5 hours. These results were measured using the Mavic 2. Individual results may vary depending on environment, use type, or firmware version. DJI will not be liable for any permission or safety issues resulting from use of third-party apps. If an installed third-party app prevents you from enjoying optimal use of your controller, we suggest you remove the app or restore the controller to the original factory settings. Coming soon; always make sure your DJI Smart Controller has latest DJI GO app and firmware. Local regulations in some countries prohibit the use of the 5.8 GHz and 5.2 GHz frequencies. In some regions, the 5.2 GHz frequency band is only allowed for indoor use. The Smart Controller will support more DJI aircraft models in the future. Please visit the official website for the latest information.